i had an e-mail today from ian parkinson. no i didn't know him before he mailed, and probably neither did you. but aside from being a reader of thewashingmachinepost (see, i knew somebody read it) ian is about to start training for something that quite a lot of us would like to undertake - the paris-roubaix sportive. exciting though it is to watch the pros hurtling across the cobbles through either the rain or dust (depending on the year), think how much more fun (?) it might be to actually try it for yourself. the paris roubaix sportive takes place every two years with the next event being on sunday 8th june 2008. ian's reason for partaking of a tingling in his nether regions was tingling of another type - he suffered a subarachnoid brain haemorrhage. eventually riding a newly built bicycle to aid recuperation, and with the grand old age of fifty closing in on the horizon, ian was prompted to attempt something a little more challenging than cycling to the shops. 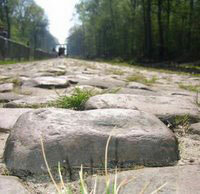 i concur completely, though i'm not sure i would have started with paris roubaix. however, since i have training to do, and iain has training to do, with a bit of luck we'll be able to bore you all to death with exciting tales of derring-do and just how many munchy bars you can stuff into three pockets. i say this because, if all goes to plan, we will be swapping notes, not just because we can, but because it's a lot harder to hide if you go public. at least, that's the theory. you may have noticed that thewashingmachinepost doesn't do mountain biking and, as i've said on many an occasion before, this is not because i have anything against it - i just think that there are many websites and blogs that do it so much better than i ever could. i don't currently own a mountain bike and i don't really have any intention of buying one in the near future, so it would seem unrealistic to make comment on a world i know little about. however, we all have a bit of mtb inside us, due to an apparent transfer of technology between the two types of bicycle, though it seems that the majority of improvements have been heading from the off-road world to that of the road. indexed gearing appeared on mountain bikes a good while before it reached your down tube; aluminium frames were popularised in the world of mud before they emulated industrial drainpipes on tarmac, and the compact frame seems to have been strongly influenced by the pragmatism of the mtb's sloping top tube. and apocryphal stories abound that it was the perennial loose headset that prompted the development of the aheadset and complementary stem allowing micro adjustment with merely an allen key (wrench). whether you feel that any of the above can be classed as improvements is really neither here nor there, because much like the motor car, they're unlikely to go away anytime soon. it's a bit harder to think of too many bits that have headed the other way - in fact other than the integrated headset, i can't actually come up with any at the moment (though i'll sit down and think harder later). however, one major feature of the world of mountain biking that has singularly failed to grab a foothold in the world of tarmac, is suspension. long-term paris roubaix aficionados will remember the trek 'y' frame road bikes that were prevented from riding the race several years ago (aren't the uci wonderful?) as well as a fleet of bianchi suspension machines that, as i remember, all broke when faced with the endless series of cobbled sections in the hell of the north. and good old rock shox, now an integral part of the sram corporation, produced a road specific set of front suspension forks called 'ruby' (get it?). paris roubaix seems to be the only road race that received serious consideration in the suspension stakes, everything else being deemed too smooth for the necessity of springs. should we find this strange? after all, my local supermarket is selling full suspension mountain bikes for a trifling £49.99 and, should anyone be daft enough to purchase one, chances are it will never see any singletrack, rutted mud or rocky descents. in other words, it will be used almost exclusively on road. witness the current cyclo cross season: sven nys comfortably wins nearly everything he enters, and he is astride a particularly rigid colnago c50 cross-bike. 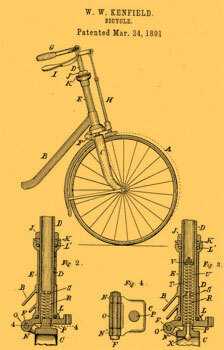 granted, his dugast tubulars are hardly over inflated, but there isn't a spring to be seen in the whole series. so why, if mountain bikers wouldn't pedal a centimetre without a bit of bobbing, have road bikes remained bounce free? well, for starters, we'd all look like total wusses - for despite the somewhat variable quality of today's road surfaces, it would be to cast aspersions on not only our man or womanhood, but also on our bike riding and handling abilities. and that's just not cricket (or any other game pretending to be a sport). and if you have ever lifted one of those toy full suspension jobbies on to the workstand, i wont need to point out that gravity has more than a thin grasp of its mass. mauricio soler would sweat a deal harder aiming for the polka dots, if he had to lug several kilos of springiness to any french mountain top ski station. but did i hear someone say 'rigidity? exactly. when we finely honed athletes need to press hard on the pedals, immediate forward motion is what we expect - if the frame were merely an amalgamation of bouncy bits, it could come perilously close to turbo lag. but i think, if we're all completely honest with each other (would i lie to you?) it's because we don't really want it. let's face it, suspension would seriously harm the carbon fibre profile we have so carefully nurtured over the years, and fausto would turn in his grave. everybody needs to have a secret weapon, whether it's being able to ask yaroslav popovych if he fancies coming out for a sunday ride, a pair of carbon fibre socks or, as many have alluded to, a dram of ardbeg in the water bottle. in v c d'ardbeg, we have found our own secret weapon, blatantly displayed in other than a cycle shop. (just to place that in perspective, we don't actually have a cycle shop, but we haven't let this deprivation worry us too much). 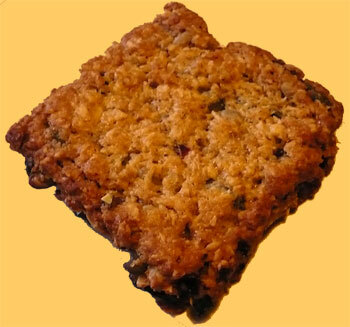 however, one of the visually less interesting creations, again not even remotely french, that has appeared on an infrequent basis recently, is a granola square. it sort of resembles a flapjack, but doesn't have that buttery, soft texture that either endears you to flapjacks or otherwise. they appear to be a mixture of grains and dried fruit baked to varying degrees of mediterranean roastedness (depends on whether it's a good day, or a bad day). since all the cuisine products are freshly baked (from frozen, part-baked originals), there appears to be no requirement to list any ingredients, fat content, carbohydrate levels et al, so short of phoning the head office of the scottish co-op (in manchester, bizarrely enough), i am taking it at face value that these things are a good energy source. they sure taste good. created in square format (assuming no breakages between oven and shelf) it's a simple matter of chopping the granola in half, wrapping it in your favoured greaseproof paper or somesuch and placing carefully in a rear pocket. it certainly tastes better than many of today's carbo bars, not too strongly flavoured - natural would be a suitable epithet - so we're a lot less likely to tire of the taste on extended rides. i will be honest and admit that i have no idea whether this product is endemic throughout the entire fleet of co-op stores in scotland, or if there is any equivalent south of the border, but should you find yourself in the vicinity of a participating store, buy a couple and try our secret weapon. you just never know when you might find an ardbeg jersey alongside on the tourmalet. this is vaguely reminiscent of the way that the thoughts from the manse columns usually start, but i can assure you that i will stick to our regular religion: cycling. i note such, since it was the arrival the other day of a rapha/rouleur mini diary/calendar that reminded me that we cyclists are creatures of habit, though we may not wish to see ourselves as such. it's a grand notion to have the ability, as testified to by graeme obree and phloyd, to shoot off into a sunset without a care in the world, least of all whether we're likely to find a filling station open at that time of night (and if you're bicycle is anything like mine, it always starts first time on a frosty morning). but habit has crept up on us while we were deciding which jersey to wear with those shorts. witness the sunday ride: maybe not all of you partake of such a weekly event, but i'm willing to lay bets that you have a regular some other day ride, whether it be a saturday or perchance, a wednesday evening. and you probably always pump your tyres to the same pressure, without once thinking how radical it would be to have them ten pounds lower or higher. 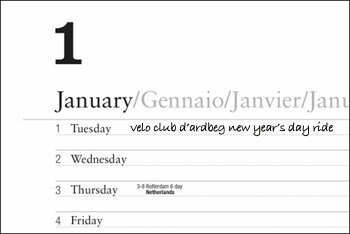 actually none of the above were even so much as hinted at in the diary/calendar, but what was noticeable was the regularity of the cycle racing calendar. paris roubaix, flanders, wevelghem: they may not always take place on exactly the same date year on year, but they are not called the spring classics for nothing and it's possible to gauge just where you are in the year by their appearance on the horizon. the giro is always mid to end may, le tour nabs most of july and no-one watches the vuelta in september. by which time we've entered the season of bike shows around the world, then cyclocross, articles on lighting and winter clothing and here we go round again. now i'm really sorry to have demystified the cycling season in such a blunt manner, particularly since it's taken me past my half century to realise this (slow learner), but rather than being the blinding light of banality that it might seem, there's actually something very comforting in such habits whether you watch from the outside, or wear your chain out taking part. habits are often difficult to break, some rightly so, others less convincingly. if you only pump your tyres up when there's a 'z' in the month, then it's time to get into the habit of being more frequent. but if you're intending joining one of the year's cyclo-sportives or even racing, then a training habit is quite likely a must. after spending every weekend at the beginning of last year (and again in the forthcoming 2008 months) grovelling through the kilometres to make sure i didn't look like a complete wuss on the way to paris, i kind of missed doing so after the event was all over and done with. apparently if you are able to incorporate a routine into your life for a period of at least twenty one days, then it becomes a habit (someone else's idea, not mine). and habits are much harder to disavow than irregular and perhaps involuntary notions. but that shouldn't worry us cyclists, since as i previously pointed out, we are already creatures of habit. since it's difficult to tell just exactly the elements that might be thrown at you at this time of year, it ill behoves the seasoned cyclist to venture out unprepared: head to toe windproofs, waterproofs and thermals, and in this case those all important gold shoes were covered with the latest footwear covering from prendas ciclismo - the windtex stretch overshoe. windtex is one of those clever fabrics that i did mention in the review of the matching winter gloves, which seems particularly apt when shifted down to the feet. it's thinner than neoprene, (possibly a tad more waterproof than same) allowing it to mould itself to whichever brand of race shoe you happen to be wearing underneath. i say race shoe because the overshoe tapers towards the heel which would make it a bit of a struggle to fit over mtb type shoes (though i'm told it can be done). there is no cutout at the heel. the sole is manufactured from what appears to be a reinforced rubber fabric with a single hole to accommodate look type cleats. if, like me, you favour the vista pedals, it pays to take care fitting this over the two prongs that feature at the front of the vista cleat. the sole does seem as if it would suffer more than its fair share of abuse, but you can never be too careful. 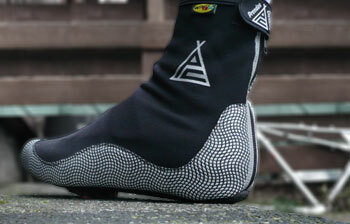 the shoes are retained in situ by a rear zip and a velcro closure to keep the zip tag in place. one of the other riders on the mince pie ride complained of cool toes while we munched heartily on the very mince pies that lend their name to the day's ride. no such complaint from yours truly, who was warm from the end of the ponytail all the way to the seams of my merino socks. since i have the furthest to cycle home, the fact that it rained for most of the 15 kilometres was of no real concern - feet and shoes were warm and dry as the colnago was put to bed for the day. if you currently find yourself without waterproof shoe coverage in this bleak mid-winter (i know, i know, but it adds character) you could do a lot worse than avail yourself of a pair of these. in true henry ford tradition, these italian made windtex stretch overshoes are only available in black, but can be had in sizes from 39/40 all the way up to 47/48 (my what big feet you have grand mama) for the remarkably reasonable price of £25. you'll be delighted to hear that the following isn't a rant, despite the topic being that of the oft unsung bottom bracket. strangely enough, it always seemed that its 'unsung-ness' would leave it relatively untouched in the march of progress but, along with the headset (now there is a rant) there seems to have been an inordinate amount of development for something that always seemed to work quite well in its original incarnation. that manufacturers continue to develop wheels and frames seems quite normal, since everyone is looking for that extra edge over their competitors, or to give cyclists the edge over theirs. but there are parts of the bicycle that are based purely on function, and no matter how much the externals alter or improve, they still require to perform the same function. the bottom bracket would appear to be one of those very components. as could be judged by the surprisingly large variety of tools in the washingmachinepost bike shed that advertise an affinity for bottom brackets, this part of the bicycle's anatomy has undergone quite a cosmetic change in the past decade or so. some of you reading may never have experienced the cup and cone bb that, up until the mid nineteen nineties, had been pretty much the only type to have existed in quantity. this chiefly consisted of a boron steel spindle, either threaded for a nut fitting at each end (usually on the cheaper variety) or drilled and threaded for bolts. it featured a fixed cup on the drive side that was generally installed with the imaginatively named 'fixed cup spanner' which was apt to slip off the two flats on the cup thereby removing most of your knuckles on parts of the frame you hadn't foreseen. on an english bb the cup screwed in a left hand thread, while the italians stuck to their right hand thread (incidentally, i have no idea why the italians persisted with this, since a right hand thread on a clockwise rotating spindle rather entices the laws of physics to show why this is just plain wrong). the left hand cup used a varity of methods to install, depending on manufacturer - either by peg spanner keying on indents on the cup face, or two slots. the left-hand cup was generally held in place by a lockring. unfortunately, by the time mass production had got hold of original equipment fitting, the quarter inch bearings fitted in each cup were usually held within a cheap steel race, which could be guaranteed to fail somewhere down the line, leaving scrap metal churning internally. many a budget machine seems to have had the bb fitted without so much as a trace of grease, thereby making destruction a roaring certainty. when it came time for adjustment or repair, the best option was to fit sufficent loose bearings, and pedalling could continue for life. the slight variations on a theme usually extended only as far as sealed cups, cartridge bearings and hollow or titanium spindles, both weight and stiffness enhancers. the advent of the cartridge bottom bracket undoubtedly made life easier for the cycle manufacturers, since these are generally easier to fit - and more lucrative for the component manufacturers. 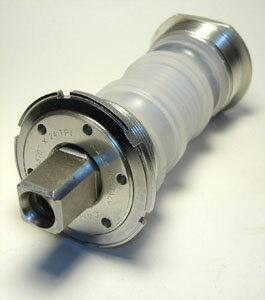 more lucrative because cartridge bottom brackets generally cannot be repaired, existing usually as a sealed unit. while the sealing used on some undoubtedly increased the component's lifespan, like all spinning bits and bobs, they do eventually wear out, at which point it needs to be removed and thrown away. it's worth noting that i have not had to refresh my stock of quarter inch bearings for many a long year. naturally enough new components demand new tools, and tools that surreptitiously seem to have become more or less manufacturer specific - as, indeed did several of the cranks. campagnolo seem to have held on to the tried and tested square taper longer than anyone else before throwing in their lot with the external bearing crowd. but yet again, the inveterate tinkerers at shimano could not leave well alone and we now have bottom brackets, jim, but not as we know them. the cynics amongst us (who me?) will point out that, while sticking bearings outside the bb shell may (or may not) pay homage to the great god stiffness, it does rather expose them to the elements in a way that they weren't when cosily ensconced indoors, but i suppose that rather depends on where you carry out the bulk of your cycling. and i'm currently trying to devise other uses for several seemingly redundant tools. much like the endless features in the monthlies at this time of year, either concentrating on the past season, winter clothing, effective lighting or all three, i feel totally justified in bringing yet another calendar to your attention. admittedly, if you have ordered one of each of those featured recently, it may become necessary to add an extension to the house for extra wall-space, but by the time we reach next month, thewashingmachinepost will have become a calendar free zone. then we can concentrate on the other necessities of cycling life such as, how come i got so fat in such a short space of time? 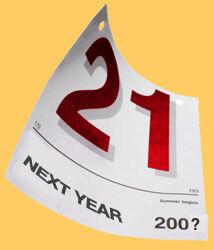 the calendar under consideration, however, a bit like marks and spencer's food, is no ordinary calendar. those who availed themselves of rouleur's photo annual will positively leap at the chance to cover a small portion of wall with more of the same - it's good to be an ostentatious cyclist in the office. yes, for the next twelve months you, your loved ones and/or work colleagues can enjoy the photographic artistry of gerard brown, ben ingham, tim kolln, camille john macmillan, olaf unzverzart and geoff waugh. practically speaking, the rouleur calendar would appear to score highly on all counts with ample space for those scribbles that make no sense even a couple of days hence, as well as pro tour and grand tour races, cyclosportives as well as the highly regarded rapha and rouleur events. and it pretty much goes without saying that the photography is breathtaking. an absolute steal at only £15 ($30) it can be ordered directly from rapha: inspire yourself for the next year - it's why we're cyclists in the first place. every discipline, be it sport, photography, music et al has something, or someone, intrinsic to the process that is part of a defining icon or standard for that particular structure. in photography it could be leica cameras, nikon cameras, henri cartier-bresson - it depends on the area of that discipline you favour, though both camera marques would be well known to photography adherents. 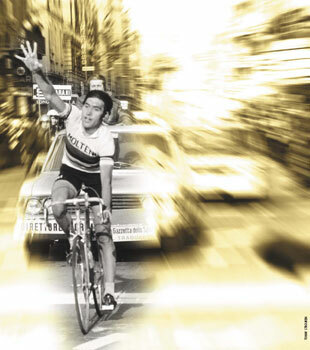 and the same is indubitably true in cycling: we have il campionissimo, anquetil and surely the greatest living cyclist, eddy merckx. you'd be hard pushed to find a cycling aficionado who would not agree with the man's stature within cycling's rich pantheon, and even several decades on from his heyday, he is still likely to be someone known to the non-cycling fraternity. so, in much the same way that coca cola, apple computer, levis jeans etc. are world renowned as highly recognisable, logos, brands, marques, whatever, and as such have a substantial marketable value, it would be fair to say that a bicycle with the name merckx emblazoned on the down tube would gain substantially from association with their personable namesake. yet, disappointingly - certainly in the uk - that seems not to be the case. how can that be? unlike bicycles bearing the name coppi, boardman (yes, i know) and several others i cannot bring to mind at present, merckx bicycles are not churned out by the thousand in taiwan or some other far eastern factory, identical in every respect to thousands of others with different decals applied. eddy merckx bicycles are constructed either in meise in belgium, or in a merckx owned and operated carbon fibre facility in italy. when so many of the great bicycle marques migrate towards at least partial construction in asia, for whatever reason, eddy continues to have all his machines fabricated in europe. and for those who have seen the video/dvd a sunday in hell the man's fastidiousness towards his bicycles and his position on same is not in doubt. so he is no empty overseer - merckx understands the bicycle business from both sides of the village depart, and there are few as well qualified. 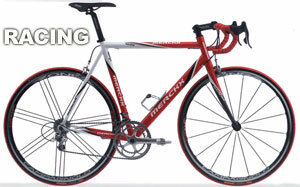 so how come eddy merckx cycles can be regarded as a minority player in the world market? 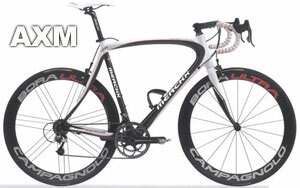 on the 2007 london-paris ride, i was privileged to be loaned a full carbon monocoque lxm for the duration, by way of a road test/review, and it was a superb machine throughout. but out of approximately 200 riders, there was only myself and one american chap astride merckx bicycles. there were more than enough treks to fill a modest retail outlet, along with fair representation from giant, colnago, pinarello and the usual suspects. in fact there were more museeuw bicycles in the peloton than merckx' (though in mitigation, these had been supplied by museeuw for messrs harmon, kelly, hallet etc.) this is not to undermine the value of these others, but merely to question why european bicycles manufactured in factories owned and operated by the greatest living cyclist in the world are so few in number, at the expense of other admittedly excellent marques, but without a similar perceived cache? merckx' early machines during his racing career were constructed by the great ernesto colnago, and subsequently by ugo de rosa - due to such pedigree, it is perhaps easy to see why these bicycles find favour in the world peloton, but it's a mystery as to why merckx cycles have not, apparently, achieved a similar pedestal on which to rest. resting, however, is not something that eddy merckx cycles have been doing, having released a comprehensive range of frames for 2008 at eurobike earlier this year. working on the if it ain't broke, don't fix it there have been few changes from the previous year's line-up, though the 1xm and 3xm have now gone. all models are available in two colourways which are not fully interchangeable, though you can swap about with the colours on the gara, track and cross frames. the non interchangeability of colours is because eddy has decided to combine paint and water transfers to obtain the state of the art finishes, so colours are model specific. the chm (tested on london paris) has been replaced by the lxm which now has a slightly less compact frame and arrives in one colourway only. in addition to the frames and bicycles, there is now a range of eddy merckx clothing and the normal add-ons such as bar tape, bottle cages, bottles etc., etc, all of which are available in the uk. there is also an eddy merckx owners club coming to a server near you very soon, with an inaugural gran fondo eddy merckx next year. for more details and pics, check eddymerckx.be, and thanks to graeme freestone king for assistance with all the above.